This ring is amazingly beautiful!!! I ordered the gold but received the silver instead. I immediately contact OS customer service and made the correction on the phone. I received the shipping label to return the silver ring immediately and my gold ring was shipped the same day as they received the return. Excellent customers service and the return was extremely easy. 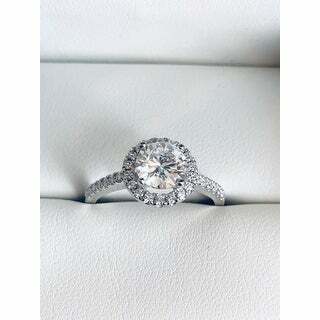 I can't believe how beautiful this ring is. It's the perfect travel companion. I can leave my set at home and use this not just for travel but it can be used as a nice change to my wedding set. Highly recommended. I love it. Bright and sumptuous, this stunning Moissanite engagement ring by Charles & Colvard will bring shimmering romance to your look. 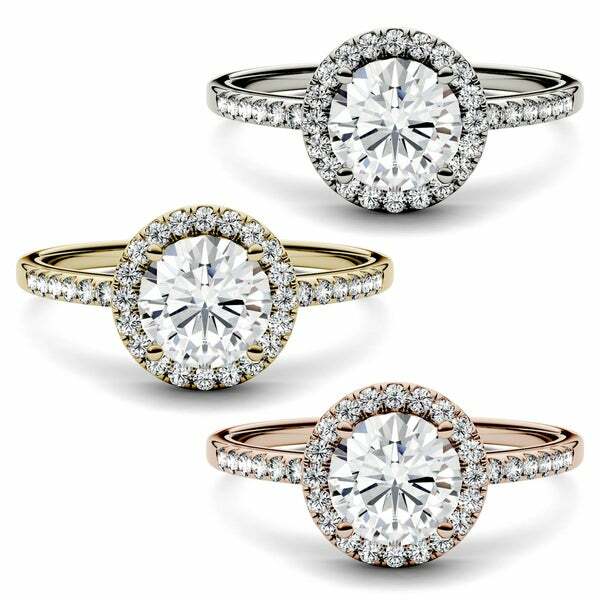 The ring is available in your choice of 14-karat white, rose, or yellow gold with a sleek, high polish finish. A stunning, round-cut moissanite sits atop the ring, prong-set inside a moissanite halo that completes the classical romance of this beautiful ring. This ring is INCREDIBLE! I can't believe the price... I bought the yellow gold and they white gold and I love them both the same! I only wish rings like this were available when I was picking out rings with my husband 26 years ago. I would have picked this ring style with moissanite over my tiny diamond any day! This white gold ring is set with a Forever Brilliant stone. The yellow gold is set with a Forever One stone. I can't tell the difference in them when shown together. 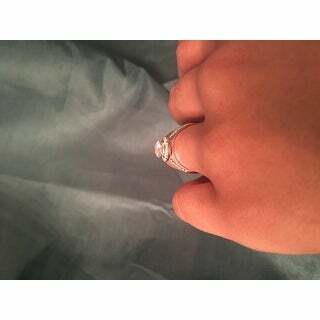 I already had a Forever One 2.5 Carat colorless stone. In the photos I'm showing all of them side by side. 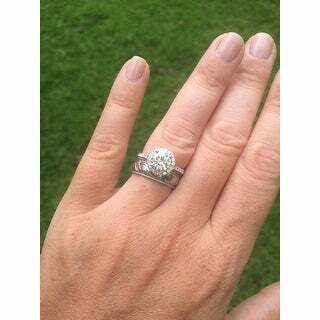 The way this ring is set makes it look as big as my 2.5 carat single stone ring! Also, in the photos, I'm wearing a 1mm band ring and my ring size is 5. Just to give you an idea of hand size and band size. Hope this helps you. If you need a white gold engagement ring this is THE best thing you will find! This was a Christmas gift from my husband! My ring is a size 7 that fits perfectly. 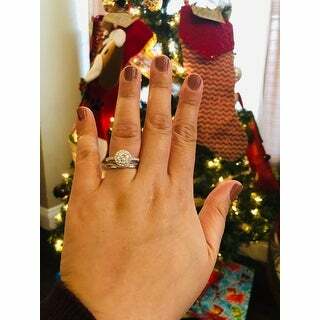 (At zales my ring size was a 7.5, and my original engagement ring had a 1/4 carat center diamond which I will forever love). I’d say this was a nice upgrade for me! This ring’s 1 carat moissanite center stone has a lot of fire and sparkle! The band looks dainty and thin which I really love. The side stones and the halo look nice and sparkly as well. It looks a lot more expensive than its listed price. This ring is very dainty and light but beautiful all the same! 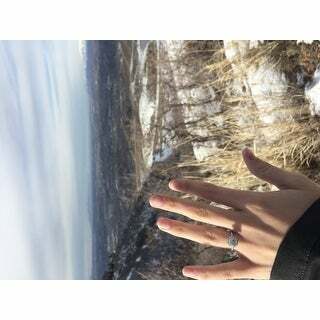 The ring came exactly as pictured and sits low enough on the finger to not snag, but high enough to fit a band. This is my second moissanite ring and I love the sparkle they have. So glad I went with this ring! The pictures on the site do not do it justice. The stone is not too big and not too small. It sparkles like crazy and looks great at every angle. It's not too high to where it catches on things and it is low for a band to fit perfectly. Let me be the first to say that my now husband and I were super nervous about purchasing this ring. We couldn't justify spending thousands of dollars on a real diamond engagement ring; but, we also wanted to make sure whatever we purchased still looked beautiful and was special. We had never heard of moissanite before so obviously we were a little nervous. After some reasearch we came to the conclusion that it would be the perfect option for our needs and made the plunge. Well, turns out the ring is gorgeous!! 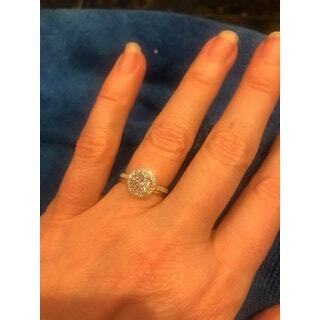 I have received so many compliments on the ring, it sparkles like crazy, and my moissanite diamond sparkles more than a real one and cost a fraction of the price!! I would encoaurage any couple to do some research on the Charles and Colvard collection. We are extremely pleased with our purchase and would totally recommended to any couple in the same situation. I got to choose my ring and I knew I wanted Moissanite by Charles and Colvard. Originally went to Helzberg Diamonds but when we saw this was 1/3 of the price then at Helzberg the exact same ring we ordered it from here! It is gorgeous in person!!! I wear a size 8 and it’s not too small or too big! The band is a little thin so we will see how his holds up but I actually like how thin it is. Very sparkly and looks like a diamond and doesn’t have much of a yellow hue as some Moissanites can have, but then again so can some diamonds... Worth every penny and would strongly recommend if your in the market for a Moissanite engagement ring or an engagement that doesn’t cost a fortune. I have been skeptical about buying this ring, but since it was doorbuster, I decided to take the plunge. I just received it today, and am I ever happy that I bought it. 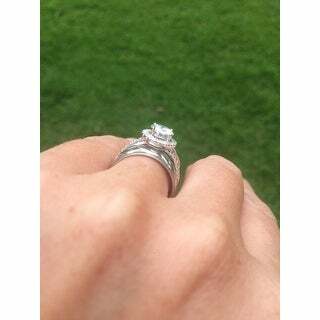 What a beautiful ring. It is well made, has a comfortable band, and the stones sparkle. I am a moissanite lover now. I compared my ring to my real diamonds. There is not much difference. 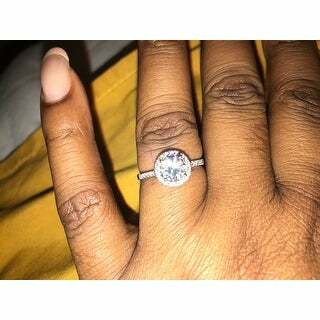 The moissanite actually is brighter. It is such a great alternative to buying a costly diamond. The band is dainty, but not too thin. I purchased the yellow gold option, because I wanted it to match a gold band. The setting is not too high, so I hope it helps to protect against the main stone being caught on sweaters and such. 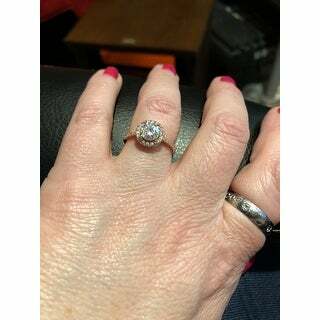 I have to recommend this ring to anyone who wants a beautiful and fairly large center stone, without paying a big ticket price. 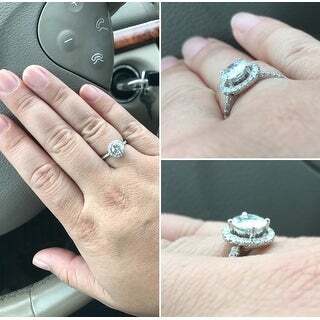 I originally purchased the 1.82 halo (exactly the same style but 1.5 carat center). I thought bigger is usually better, but it was way too HUGE for my taste, especially with the halo. It looked gaudy and had a stronger yellow hue which is typical of a larger forever brilliant. It was just unrealistic, so I returned it the next day. Luckily, this ring went on sale again, so I quickly purchased it. The center stone is the perfect size like everyone says-not too big but not small either. It sparkles like crazy and the halo makes it look larger too. In certain lighting the center stone does look warmer which I don't mind. I think it makes it look more like a diamond-but conflict free. Absolutely adore this ring! My pictures don’t do it justice. I love the sparkle! I have wanted a halo ring ring for quite a while, but wanted something believable that also fit my short fingers. Going over a certain size just wouldn’t have made sense for me. When I came across this ring as a doorbuster, I researched moissanite and was happy with what learned about it and C&C. I placed my order and it arrived a day early. It was love at first site and I’ve worn it every day since it has arrived. Even slept with it on a couple of times. 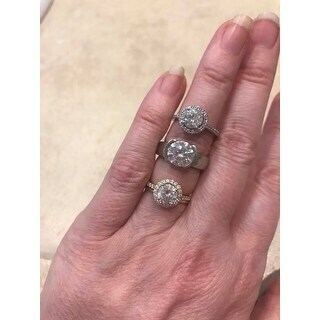 At first, I thought the ring was still too big (my original engagement ring is small), but got used to the fact that the halo is what is creating the seemingly larger affect. The band on this ring is slim and dainty, but well made and comfortable wear. I have both a simple diamond wedding band and diamond eternity band that match beautifully with this ring without being too matchy. I included pictures of the C&C moissanite halo ring by itself, with my diamond eternity band, and with my diamond wedding band. The ring behaves as the diamond rings do with the exception of the moissanite having more fire in the large middle stone. Some have mentioned a yellow tint. I haven’t noticed one in mine. Since this is near colorless, it’s probably there faintly, but nothing I have caught in any of the light settings I’ve been in. C&C provides a limited lifetime warranty on the gems and a 12-month warranty on the work, but note that loss of gems are not covered. Either way, it’s a very beautiful ring. The quality of the work shows. 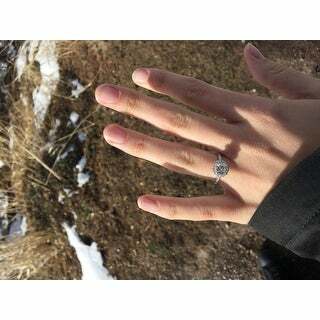 I was nervous at first, but I am so happy I went for this ring. Such a great buy and Overstock’s service was great as always. Definitely recommend. This ring exceeded my expectations. I am a huge fan of Moissanite jewelry. I have only ever purchased Charles &amp; Colvard stones. I wanted a ring for myself, but I was looking at much more expensive rings with the new colorless stones. I found this ring on sale, and I was compelled to buy it because of the price. 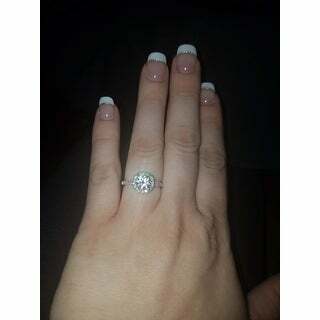 I was nervous about a larger stone having DEF color, as I had an old Moissanite stone that was very green. 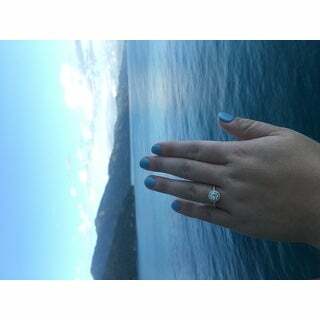 However, when this ring arrived, I was ecstatic. It was beautiful! The only time it does not look colorless is when I am looking at in natural light on an overcast day. It grays slightly. I am not bothered by this as this ring is brilliant the rest of the time. I have read other reviews about the side stones falling out. I have not had this issue. I have been wearing this ring daily for months now. I am not a dainty lady. I can be rough and clumsy, and this ring has withstood all of it. This ring rivals diamond rings 10X the price. It is absolutely gorgeous. I get many compliments on this ring. I am so happy that I went with this one. This ring is exactly what I was looking for. I used it as an engagement ring. The Forever Brilliant Moissanite stone hasn't lost a bit of it's shine since the day I bought it. I would definitely recommend to anyone! I ordered 5 rings. Yup. I just needed to see all of the same general style with the subtle differences. When I opened this one I knew it was the one. 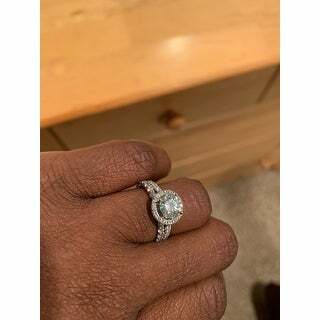 It sparkles and even in the type of light that might give away it's a moissanite, it looks more like a very light chocolate diamond than a yellow one. You can sit a wedding band flush with it which was extremely important to me. I don't want to get stuck having to order one specific band that would add too much to the ring. It also sits low which is semi-important to me. I am a bit careless and don't wear a ton of jewelry. I don't want to have to worry about snagging this everywhere. 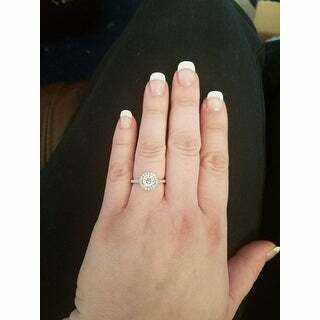 Hubby bought as my upgraded engagement ring! This ring is gorgeous!! It is a perfect size, not too big and gaudy, but it’s definitely a 1-carat look! It sparkles like crazy in sunlight and certain inside lights. I took it to get sized at a jeweler and they didn’t know it wasn’t a diamond by their naked eye until they put it under that tool that identifies the stone. I put similar halo rings from that jeweler on my finger with this one and TRULY no one will know the difference!!!! I get a ton of compliments on it. If you are on the fence I’d say go for it...you’ll love it. I also bought two diamond bands from this site to wear on either side and they look great together...see pic! 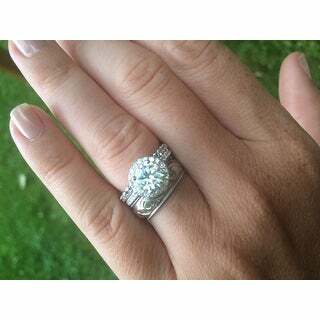 Is a beautiful ring and is exactly what you would expect it would look like. You would never believe it does not have a real Dimond. My fiancé and I agreed that we didn't want to spend thousands on a ring. I started looking around for Moissanite rings and was slightly hesitant because I didn't want my ring to look fake and tacky. I got my ring in today and I couldn't be more pleased with the appearance! It's absolutely stunning. 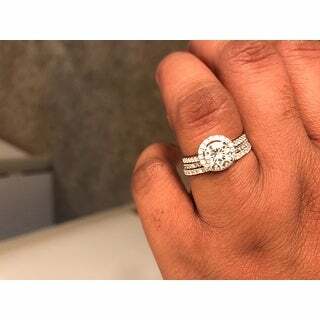 I own SEVERAL diamond rings and earrings, the truth be told I love this ring way more. I'm very happy with the purchase! I'll be buying the wedding band next. 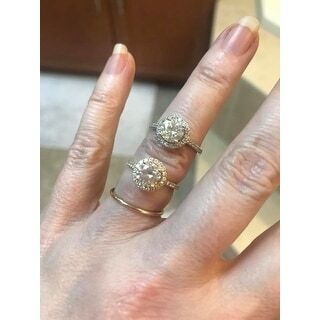 Dont buy this ring in white gold for sure. Since I bought it after a couple months of use it has turned yellow when it is supossed to be white. Had send back two times already to get fixed and at the end it always go back to turning yellow. I love this ring and receive a lot of compliments when I wear it. I have wanted a moissanite for awhile. 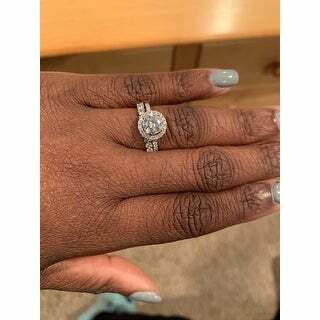 Diamonds are way too expensive and I knew moissanite was a great alternative. So at the price who could say no. I got the rose gold and I am so happy with it. It’s beautiful. I keep staring at how sparkly it is. Good design. Not as well crafted as some of the rings direct from Charles and Colvard. 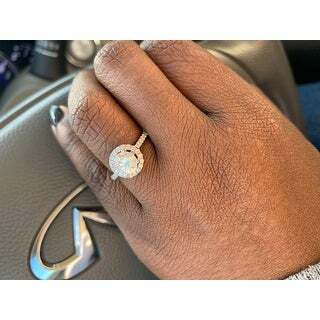 Its a great ring for the price! This ring is absolutely beautiful! I love everything about it! It looks exactly how it appears in the photos. I highly recommend this ring. It sparkles so much, the stone appears bigger than it's actual size. The setting appears to be very sturdy which is needed because I wash my hands often at work. 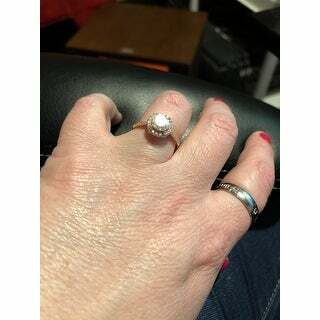 "My son bought this in rose gold it turned is girl finger green?? 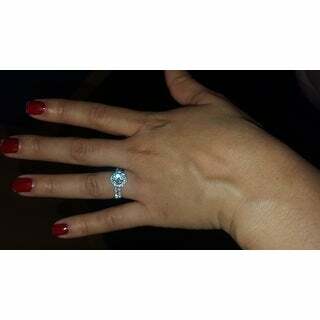 why "
"Will a thin pave set diamond band sit close or flush with this ring ? I have two diamond pave set thin wedding bands I’d like to wear a halo between. Thank you 😊"
Yes, the setting does allow for a straight band to sit flush with this style. "Does this ring come with the Charles and colvard limited lifetime warranty and the authentication card? " "One reviewer mentioned the white gold is set with a Forever Brilliant stone and the yellow gold is set with a Forever One stone. Is this verified information? 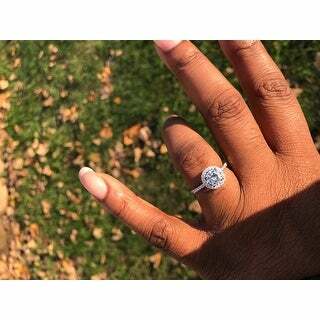 I have purchased the ring in yellow gold; will it be set with a Forever One stone?" This is GHI in color, but has more of an icy blue hue than the yellow that was often associated with Forever Brilliant. "Can I order this ring in size 8.5?" Unfortunately this is not made in half sizes. "Site says it is 14k gold, but there's no stamp inside. Is this real or fake gold?" All Charles & Colvard items should include a 14k stamp. If your piece is not stamped, please set up a replacement order with Overstock and your replacement will have the 14k stamp. Our gold items are indeed 14k gold. Yes, the 6.5 mm center stone in this ring is a Forever Brilliant moissanite gemstone.